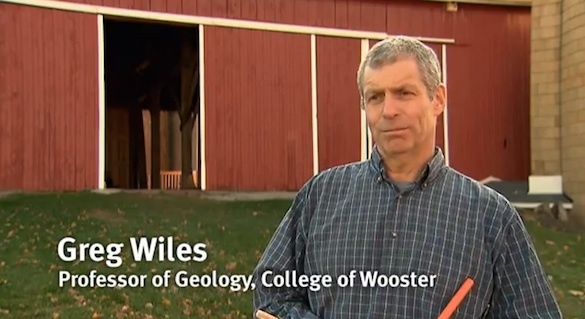 “Barn Detectives” is a recent episode of the television show Our Ohio, and it features Dr. Greg Wiles and his team of crack dendrochronologists. You can view the video by clicking the link. It is very well done. The project described in the program is the dating of the Emerson barn in Apple Creek, Ohio. 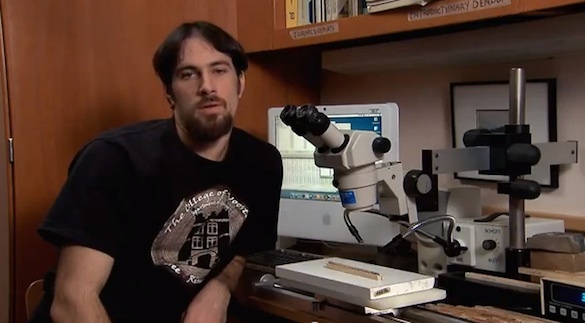 These Wooster scientists study the tree rings in the beams which were used in the original structure. Careful analysis of these rings will show the year the old-growth trees were cut for timber, and thus the date of the building. This work not only gives the Emerson family a date for a treasured building, it also provides additional dendrochronological data for studying climate change in the last two centuries. 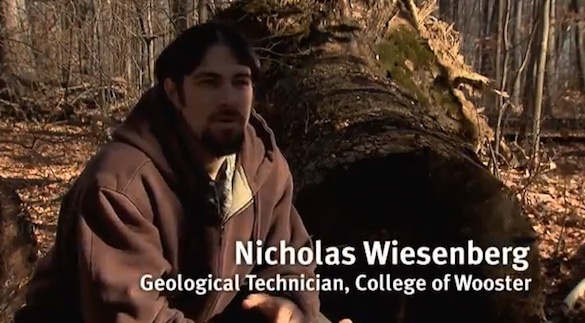 Our geological technician Nick Wiesenberg provides explanations of the process from the barn, a local old-growth forest (Johnson Woods, see above), and the dendrochronology lab at Wooster. Geology senior Lauren Vargo describes the value of tree rings for climate history, and is shown in several action shots of coring and sanding. Back in the lab, Greg shows how the cores from the Emerson barn are counted and measured with our video microscope system. On the monitor is a magnified view of rings from the Emerson barn. Nick had the honor of announcing the calculated date the trees were cut to make the barn’s beams: (Spoiler Alert!) the Fall of 1845. The ground would have been hard then and the farmers would have had time to collect materials for the construction. 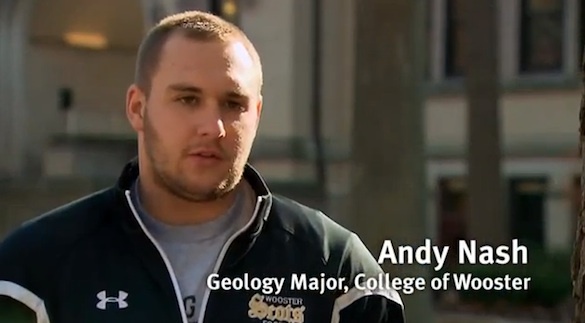 It was great fun to see our students and colleagues explain their work so well, and to show the world the enthusiasm and professional skills of Wooster’s dendrochronologists. The full “Barn Detectives” video is available on YouTube at this link.